We too often hear how out society is checked-out, apathetic, overwhelmed. There is a LOT of keep track of and cope with in the news today - in no small part because there's so much news coming at us constantly. But keeping engaged as citizens is IMPORTANT. The Missouri Coalition for the Environment has a new tool to help us be active, responsive, inquiring. It puts efficient, effective potentials in our pockets. 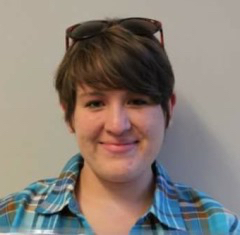 Caitlin Zera, Community Engagement Manager for MCE, leads the team developing The People's Pocket Guide to Environmental Action. A pdf version is available now. MCE staff and volunteers are distributing (pocket sized!) print copies at community outreach events, and will be offering citizen action trainings starting this fall. 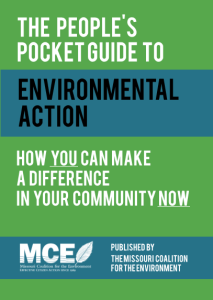 An interactive online Pocket Guide is in the works, giving MCE and many partner organizations the capacity to illustrate the basic action measures with community issue examples. As Caitlin talks through the action process with Earthworms host Jean Ponzi, we are confident you'll get the goal this guide's subtitle energizes: How YOU Can Make a Difference in Your Community NOW.